Megan and Lupe have been sweethearts in the truest sense of the word for years. Their long awaited wedding was a modern, colorful, family affair with a side of traditional glamour. When I met with Megan she asked me if I was comfortable shooting a large wedding party - little did I know she meant a wedding party of 31! Fast forward to the wedding day - I show up at the gorgeous church in Tacoma where they are having their wedding, and I’m thrilled to see such an open, modern space with amazing colored lights and clean lines. Add in a gorgeous gazebo in the back for portraits and the sweetest first look with her dad, and it was just a winner of a wedding venue all around. I’m especially fond of the gorgeous bridesmaid dresses that Megan chose - the dresses were flattering on everyone, even her cousin’s sweet baby bump! And can we talk about the shimmery, fairytale perfect wedding dress she chose for herself? In some kind of magical material voodoo the bottom of her gown shimmered in the light as though there was a fine dusting of glitter all over the bottom half. I have dress envy to this day! The dusty purple color the couple chose was carried throughout the wedding decor, and the dahlias and florals were a wonderful accent in their darker purple tones. There were so many wonderful parts of this wedding celebration. 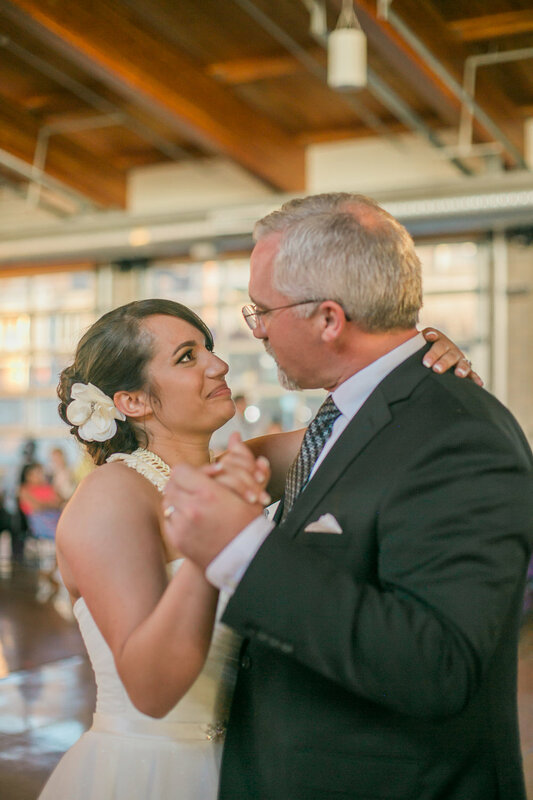 From the touching first look with Megan’s father, to the exchange of letters before they walk down the aisle - there was so much love to love. It really was a perfect wedding! After a beautiful Traditional Christian ceremony the couple took off for Pioneer Park Pavilion in Puyallup Washington. While family was arriving we took some extra time, and got a few more romantic portraits in the park before their grand entrance - with an exuberant and rowdy greeting from all of their family and friends. The couple included several traditional Samoan dances into their wedding reception, and Lupe - more commonly referred to as Junior - surprised Megan with the most amazing choreographed dance that he and his groomsmen secretly planned, practiced, and performed for her! After the traditional dances, the toasting, and cake cutting this large combined family danced the night away and took advantage of the photo booth and fun props we set up for the reception. 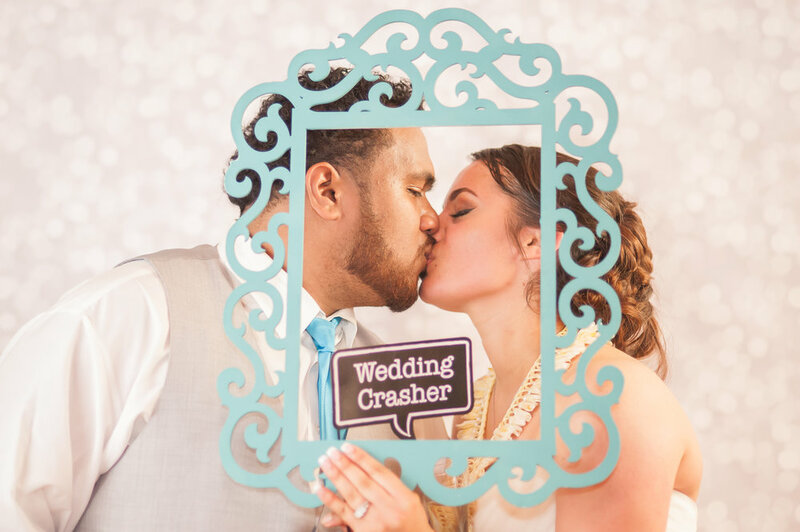 Overall this wedding was a wonderful combination of time honored Samoan traditions, a beautiful faith based Christian ceremony, and plain old F-U-N and playfulness. These two high school sweethearts gave everyone a wedding to remember. They combined all of the things that meant the most to them and made a grand exit by taking off into the night after a magical sparkler exit under the stars!